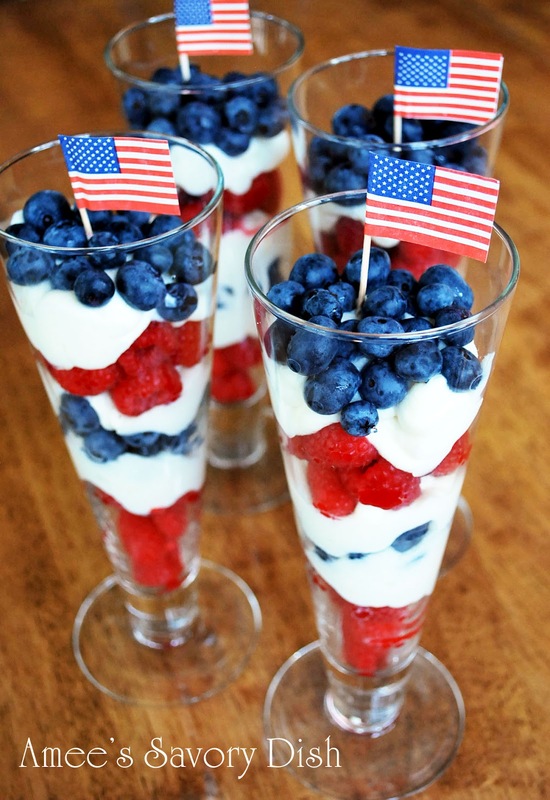 These patriotic Skinny Berry Parfaits are a wonderful light dessert for your Fourth of July gathering. They are simple to put together and make a lovely presentation. Have a safe and happy holiday! This patriotic themed fruit parfait dessert is perfect for a Memorial Day cookout or a 4th of July dessert. A healthier no bake dessert, perfect for summer! Starting with the raspberries, layer the berries in a tall parfait glass, then the filling, ending with the blueberries on top in a tall parfait glass. Repeat for each parfait. Chill for a few hours and serve. Just discovered your blog because of your award nomination from the Saucy Gourmet. Congrats! I love your food point of view. This looks just as tasty, and a lot healthier than my 4th recipe!! Way to go. This looks like a festive, healthy recipe for the 4th! Thanks for sharing on Foodie Friends Friday! Such a beautiful photo! These look really yummy and healthy! Thanks for sharing on Foodie Friend’s Friday! Please come back next week and share another great recipe! Do you know how many servings this makes? I have 10oz. parfait cups. 8-10 oz cups would be perfect Dana.